DJI iOSD Mark II On Screen Display for DJI Wookong M & A2 M.
The iOSD Mark II On Screen Display is for the DJI Wookong M, A2 M AutoPilot and Ace One series AutoPilots. 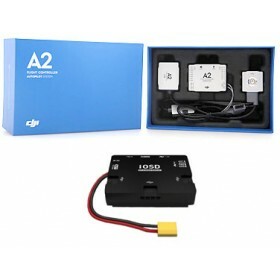 The iOSD On Screen Display enables the pilot to monitor the real-time flight data from the Wookong M WKM, DJI A2 or Ace One Autopilot systems while in flight using First Person View (FPV). The DJI iOSD MARK II can record the flight log, which will help you to record the input and output information of every channel, GPS signal, power voltage, home distance and height, etc. 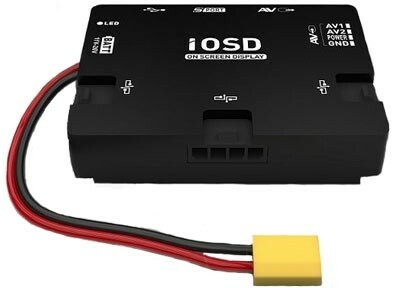 The iOSD is a multifunctional integrated on screen display module which also has a built-in BEC module that supports 3s-6s LiPo batteries (11-26 volts), when used with the Wookong M, A2 M or Ace One professional autopilot systems, it delivers a total solution for aerial photography with key information clearly displayed around the outside of the screen. 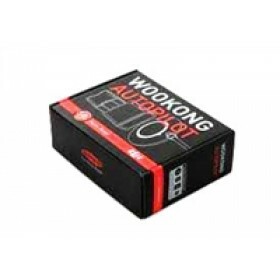 The DJI Innovations iOSD Mark II only supports the Wookong M, A2 M AutoPilot and Ace One systems at this time. The iOSD supports two video input sources, one of which can be selected by the R/C transmitter and switched remotely. It can also change the wireless the transmission channel using the wireless video transmission module by DJI. The iOSD can be upgrade in the future by firmware updates.